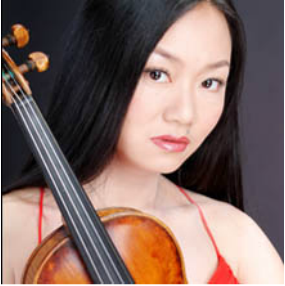 Described by Philip Roth in The Strad as “a significant world-class artist”, Qian Zhou is recognized internationally as a violinist, recording artist and teacher of the first rank. At the age of only 18, Qian Zhou received instant world-wide recognition with her brilliant triumph at the 1987 Marguerite Long-Jacques Thibaud Competition in Paris, breaking all precedent in the competition's 50-year history by winning the First Grand Prize and all five major prizes. Her victory and the international attention it drew enabled her immediate access to the major halls and performing opportunities around the globe. For more than twenty years, she has been a frequent recitalist and soloist with orchestras in Europe, United States, Asia and Africa. Past engagements include concerts with the Baltimore Symphony and Chamber, Beijing Central Philharmonic, BBC Symphony, BBC Scottish, Bournemouth Symphony, Hong Kong Philharmonic, Orchestre Philharmonique de Radio France, National Orchestra of Ile de France, New Japan Philharmonic , Osaka Symphony, Rome Symphony, Russian Philharmonic, Singapore Symphony, Shanghai Symphony, Spanish National, Taipei Symphony and the Vienna Chamber Orchestras amongst others while recital highlights include performances at the Amsterdam Concertgebouw, Carnegie Hall, Kennedy Centre, Royal Festival Hall, Suntory Hall in Tokyo and the Vienna Concert Hall. While theWashington Post praised “her expressive talents, fluid phrases and delicate, at times almost weeping, vibrato, ” Le Figaro commended her "great violin playing”, acknowledging her as “a very great artist", and La Nazione in Florence noted “her performance was an inspired force…accompanied by a technical polish, communicative capacity, and an expressive candor that was absolutely enchanting.” After a performance at the Evian Festival under Rostropovich, the Dauphiné Libéré offered “she is a poet in the etymological sense: one who creates beauty and happiness." Qian Zhou’s ten CDs with the Naxos, Hugo and Hungaraton labels have embraced a wide range of repertoire from Bach to Bartok to also drawn praise of the highest calibre. Her recording of the Beethoven concerto was described by Henry Roth in The Strad as “technically impeccable… burnished with beautifully-focused tone, a vibrato that spans the full gamut of colour, and an astute sense of pacing, all replete with sensitive nuances. “ He continued “her phrasing is breath-taking; not a note is ‘wasted’ or ignored, all delivered with a rare nobility of spirit”. Her Glazunov concerto was perceived as “extraordinary: full-blooded, suave and sophisticated, yet uncommonly thoughtful.” while her recordings of the complete Dvorak works for violin piano were praised as “strikingly confident, each note invested with glowing lyrical import." Recent performances have included performances in Argentina, China, Greece, Hungary, Israel, Singapore, Spain, Switzerland, Taiwan, the United Kingdom, and the United States, combining her enthusiasms and capacities as a soloist, recitalist, chamber musician and teacher. A highlight of this season was being selected in December 2012 by CCTV for a programme which highlighted the 10 Outstanding Violinists of China. Upcoming performances include concertos in Australia, China, Hungary, Italy, Japan Russia and the Ukraine, with festivals including Qingdao (China), Bangalow, (Australia), Inter harmony (Italy) and Keshet Eilon (Israel). Qian Zhou plays a 1757 J.B. Guadagnini, generously loaned by Mr and Mrs Rin Kei Mei.